The pace of innovations in genomic and other molecular research technologies and developments in information technologies over the past few years have contributed to generating a tremendous amount of information related to molecular biology and the primary goal of bioinformatics is to increase the understanding of biological processes. Some of the grand research areas in bioinformatics include sequence analysis, genome annotation, analysis of gene/protein expression, analysis of the mutation in cancer, protein structure prediction, and comparative genomics. Goldstein Research analyst forecast the Bioinformatics Market size is set to reach USD 17.5 billion by 2024, at a CAGR of 20.5% over the forecast years. The report covers the present ground scenario and the future growth prospects of the Bioinformatics Market for 2016-2024 along with its penetration in all the verticals and its future aspects in other fields as well. We calculated the market size and revenue share on the basis of revenue generated from major players across the globe. On the basis of product type, molecular medicine held the largest market share of 30% while preventive medicine is anticipated to grow at a faster CAGR of 25% over the forecast period due to the increasing awareness about its key specialties like aerospace medicine, occupational medicine, and public health and general preventive medicine. 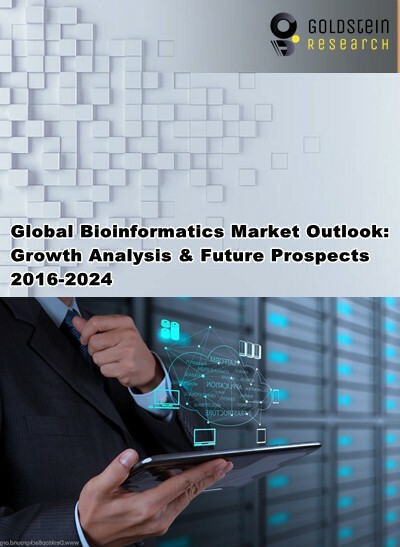 Bioinformatics Market Outlook 2016-2024, has been prepared based on an in-depth market analysis from industry experts. The report covers the competitive landscape and current position of major players in the global bioinformatics market. The report also includes porter’s five force model, SWOT analysis, company profiling, business strategies of market players and their business models. Global Bioinformatics market report also recognizes value chain analysis to understand the cost differentiation to provide competitive advantage to the existing and new entry players. Our global Bioinformatics market report comprises of the following companies as the key players in the Bioinformatics market: Illumina Inc, Waters Corporation, Agilent Technologies, Inc, Thermo Fisher Scientific Inc., Sencel bioinformatics, S.A.F.A.N. Bioinformatics SAS, Biovia, Regeneron Pharmaceuticals, Biomax Informatics AG, Qiagen n.v., Inc, Geneva Bioinformatics SA, and Noray bioinformatics SLU. According to the report, major driving factor for Bioinformatics market is the application and development of data mining techniques to solve biological problems as analyzing large biological data sets requires making sense of the data by inferring structure or generalizations from the data. For instance, analysis of statistical modeling of protein-protein interaction, protein structure prediction, gene classification, cancer classification based on microarray data, clustering of gene expression data, etc. Further, the report states that the major challenge is to decide which data sets to archive and which to discard also known as data deluge and in addition other challenges include knowledge management and predicting and not just explaining hypothesis. Based on geography, North America is leading the Bioinformatics market with the market size of USD 5.89 billion in 2016. Europe is the second largest market for Bioinformatics as countries like Germany and UK have huge bioinformatics market stimulated by the continuous R&D activities in the region. The bioinformatics market is projected to show a steady growth in Middle East & Africa and Latin America because of the growing bioinformatics platforms stimulated by proteomics and genomic growth. What is the revenue generated Bioinformatics industry in 2015-16 and what would be the expected demand over the forecast period?